This set of plates due to their semi circle shape prevent the incisors to come off the bite plate. The extra wide arms keep the speculum away from the equine's cheek making more working space for the technicians to use various angles to access the horse's mouth. 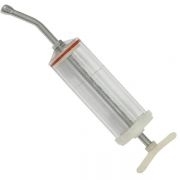 For use with the Millennium speculum, the SE Speculum or the Hausmans.